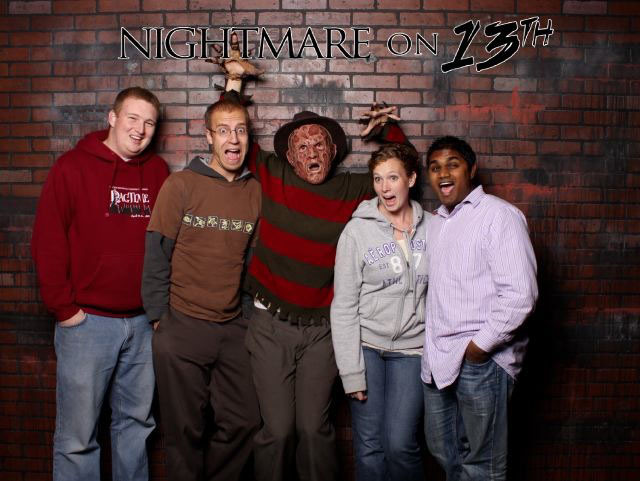 To kick off the Halloween season, the genius, the friend, the daughter, and the hubby went to a haunted house. I had to work. . . I know BORING! The report is that they had a great time. It's funny how previous to this year Halloween as a holiday, if you can call it a holiday, has never had much appeal to me. I think this year is different because of you. See, it's always been about getting costumes ready for the kids, this year, it was either me or the dog. 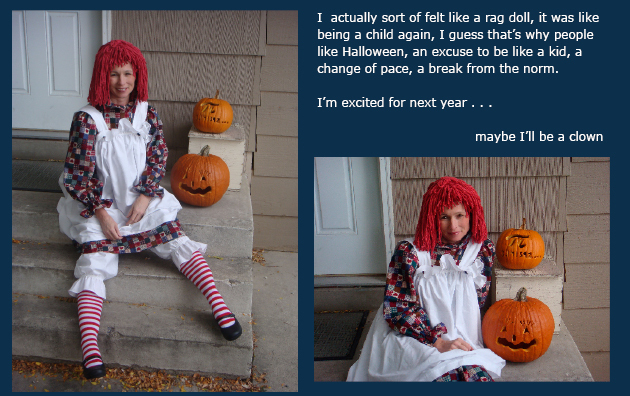 . . but this whole blog thing keeps me thinking about how to have something amusing to write about, Halloween seemed like just the ticket. . . 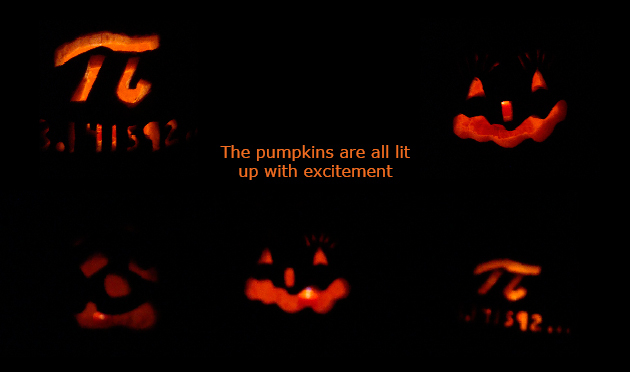 It all started with dreams of a pumpkin patch. Sort of like the one you see Linus and Charlie Brown sitting in, while waiting for the great pumpkin. . .
Well, we didn't quite find a pumpkin patch, I think we waited a little too long to go pumpkin shopping, we did find great pumpkins at a local farm though. The genius and the friend are all on board with eagerness.
. . . and the pumpkins are all safe and comfortable for the ride home. Mine is the BIG one! 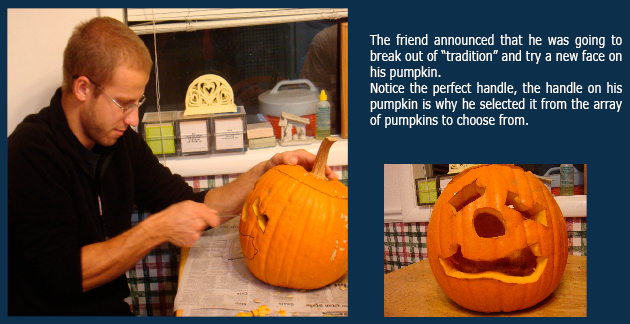 The table is covered with newspaper, and we have the handy dandy pumpkin carving tool kit out. I actually purchased this little set of tools several years ago while in culinary school. 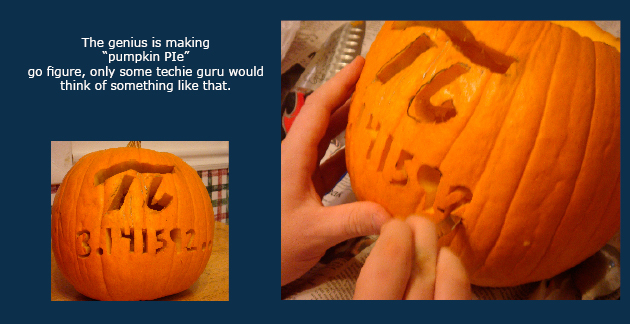 Who would have guessed that it would come in so handy for pumpkin carving. I think it's the only time of year that we use it. All cleaned up, and our pumpkin friends are waiting for Halloween night! Using a mop, some red dye, salt, a large pot, and hot steaming water, simmer the mop for a couple of hours. Rinse with lots of cold water and you get. . . .
give the mop a hair cut and you have the perfect Raggedy Ann wig. Figuring out the pattern can be the biggest challenge. but they were HUGE and they all had to fit on my piece of fabric. Because we live in a small house, our kitchen table wears almost every title, craft table, work table, dinner table, work bench, construction zone, butchers block, homework station, parking spot for groceries, purses, anything that comes in the door usually gets parked on the table. it serves many functions, and it is not uncommon to be wanting a place to sit to eat, and we have to relocate the current project for a minute. It seems like the table is never really cleaned off.
. . . . . but the final product was great. We had the option of dressing up for work, it was fun. but I will have to fix it later. Off to work we go. . .
Other people dressed up too. . . . . I just received this picture via e-mail. 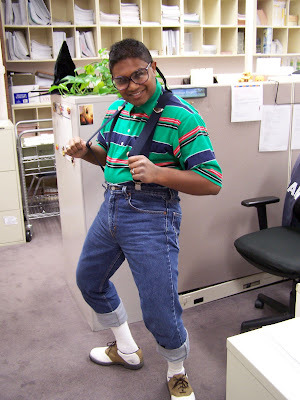 The daughters hubby dressed up for his long day at the office. . . not bad. the daughter, the genius, and the friend were fuddy-duddies! We will work on them for next year. . . and maybe even the dog. . . The Daughter came up for her birthday and so we made her favorite b-day cake. She loves spice cake and since it was a full and very busy week I decided to go simple and surprise her. Spice cake with German topping. This is a rich cake and full of calories, but worth every bite. My philosophy: if you are going to eat, make it taste good and worth it. For dinner we went out for all you can eat pizza. A perfect b-day celebration. The Daughter's hubby is waiting patiently for cake! The Genius, not so patient. . . . Ever heard of the chant, I scream, you scream, we all scream for ice-cream? Sometimes I wonder if that little chant was made just for us. We love ice-cream at our house. If we have it in the freezer, we will eat ice-cream for breakfast, lunch, dessert., or anytime for a snack. We have even started to convert the hubby, which is pretty great. believe it or not, between the four of us, we completely finished this tub of Farr's Vanilla Bean Ice-Cream (my personal favorite flavor) over the course of two days! Just for the record, the hubby helped a great deal in depleting our tub of ice-cream. Yummy, Yummy. This is a slice of moist, rich, delicious spice cake. To make spice cake you need quick oats. I don't know of any other use for quick 1-minute oatmeal other than this cake, I think they are pretty gross as oatmeal for breakfast. . . .
mush is the only description that comes to mind. I love real oats, and have those almost every day for breakfast. add in the flour and spices, and mix with a paddle attachment. Pour into baking pans, and bake. could take home with her. That makes her birthday last an extra couple of days. you know it is done when the cake just barely pulls away from the sides and the center will spring back when you lightly touch it with your finger, it won't leave a finger print. but regular pans will work just fine. To create the favorite birthday cake, first you have to tort it, we typically have five layers. While possible, this can be a little tricky to do without a cake slicer. It works best if you have evenly sliced cuts. just be careful not to mix up which direction and which order you cut each slice. Line your serving dish with pieces of foil before placing your cake on the plate. Use strips, not just one piece. move the cake slices onto the plate centering the first cake slice over the foil. Alternating between cream cheese frosting and German filling, fill between each layer. Cover the entire cake with cream cheese icing. Cover the top with German topping. and drizzle with caramel sauce. Your cake is ready. . . I know this event was over a month ago, and now I am finally getting it posted. You have to understand that the concept of a blog was not even a thought in it's infancy, so we were lacking in pictures for this new adventure posting of a blog. The daughter came up for her birthday and we "recreated" a couple of pictures. As mentioned earlier, I will get better at pictures I promise. Even this past weekend while in Park City with the daughter, her hubby, and the genius, I missed out on a great classic picture because I just wasn't thinking about things from a blog perspective. 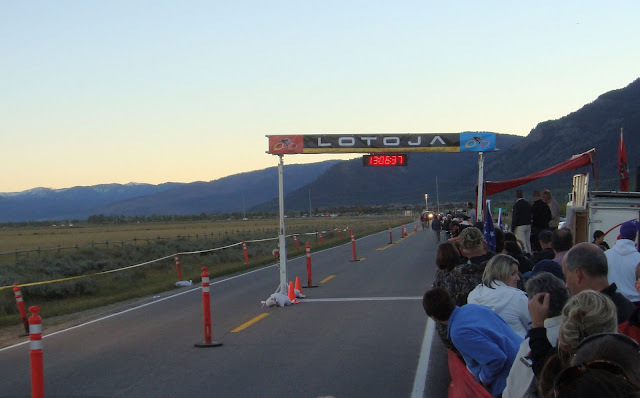 Enough rambling for now, lets talk about the bike ride from Logan, UT to Jackson, WY, otherwise known as . . . .
LOTOJA is an event that we plan on before it's over. Every year as soon as we get home, I request it off for the following year and now that I am actually riding this race, it has a whole new level of passion, fun, and adventure. 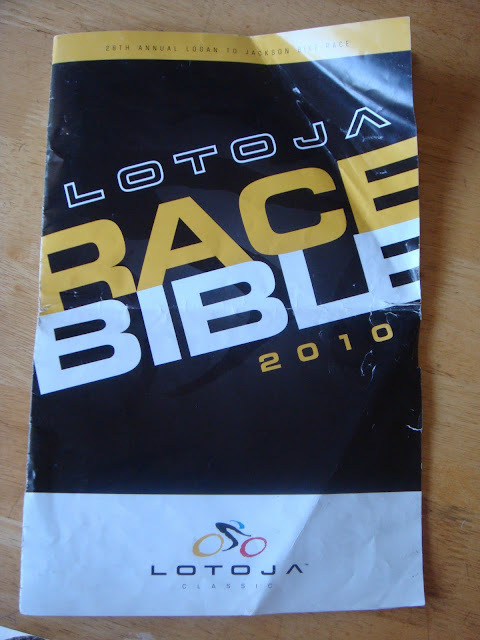 This is the trusty race bible with all the instructions and information the support crew needs. It is full of details, maps, guidelines, elevations, time cut-offs etc. One essential thing that needs to happen is that you attach your frame number to your bike and it needs to stay there for the entire ride. this is my frame number, such a good number don't you think? It took a minute to figure out how to attach it so it wouldn't flap in the wind for hours driving me to absolute distraction! It was too tall/long to go around my seat post in a vertical position, so we ripped it in half and securely attached it to my saddle bag without letting the packing tape touch the bike. Allow me to introduce you to Florence, my pal, my friend, my bike. . . .
fresh lube, nice and sparkling clean. All ready to go. . . The support crew in cars, follow the blue path, the bikes follow the red paths. They meet the cyclists at "feed zones" to take care of essential needs, you can drop off excess clothing or put clothing on, they also bring food, and moral support. The support crew makes the ride fun by hooting and hollering encouragement as they pass by their rider. They make the ride worth riding in many ways. The one exception with the map, is after alpine, they follow the bikes instead of the "recommended" auto path. 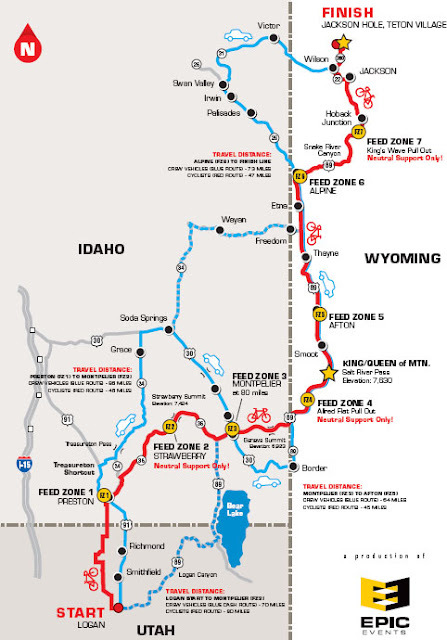 I like that because you get to see them drive by in Hoback Junction where there are several scenic pullouts and they can stop and wave at you as you ride by. LOTOJA, is a bike ride that begins in Logan, Utah and ends in Teton Village, Jackson, Wyoming. We travel a total of 206 miles, cover three states, (Utah, Idaho, and Wyoming), climbing close to 8000 feet and three mountain passes, all in one day while having a great time! The most difficult part is after a full day of riding a bicycle, going over all those mountains, your mind keeps telling you that you will drop into Jackson, but this is not true, it's UP HILL! as I came to the last big hill, well it was actually a pretty small hill by comparison, I honestly didn't think I could do it, I didn't know if I even wanted to climb that hill, and honestly, at that moment in time, didn't care. My legs were hammered. I actually stopped at the bottom of said hill, and contemplated calling my trusty support crew to come and pick me up. 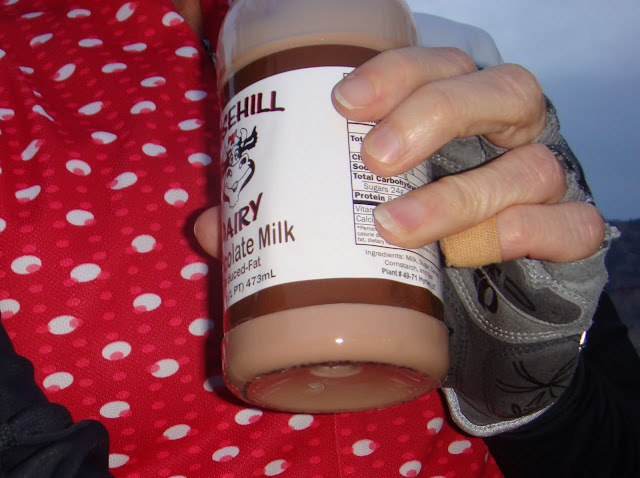 I remembered I had a cold chug of chocolate milk waiting for me at the finish line, that had been in ice all day, telling myself in order to have my reward I must get up over that hill. It wasn't working. I then retrieved a little sandwich that I had been hauling in the pocket of my jersey since Montpelier. While eating my steamed roast beef and cheese sandwich, and debating my options about how to conquer the Hill, the roast beef must have done something to my brain cells, because after literally 10 minutes, I was once again peddling up the hill. The good news was that at the top we went down hill, ahhhh, that was a nice bonus. This is my LOTOJA purchase for 2010! A blanket that is so incredibly soft, fluffy and warm! When I finish a long ride I usually get cold, very cold, (but, anyone who knows me, knows that I am always cold, I wear sweaters all summer long) so it was the perfect purchase. Something to snuggle up in while we drive to the hotel. and then home the following day. It worked like a charm, except the genius kept trying to thug it from me, he liked it too. . . but I won in the end. I purchased one of these water bottles for each of my support crew for memorabilia. I colored the wheels of the bike on mine so the genius wouldn't try to claim mine for himself if he misplaced his. I'm so smart sometimes I amaze even myself. The color rubs off eventually so I just color it all over again, just like being in elementary school again, coloring with markers is fun. Getting ready for this event is no small undertaking! the amount of gear needed for just one day can be a little overwhelming. The car was completely stuffed and this is all the things that I wore at different times throughout my big day. Jersey, shorts, leggins, insulated leggins, helmet, sunglasses, wickie, headband (to keep my ears warm), shoes, gloves, full fingered gloves, arm warmers, insulated arm warmers, thermal jacket, booties, duffel bag, socks to match the jersey (it's very important to look good on the bike). Everything is present and accounted for. 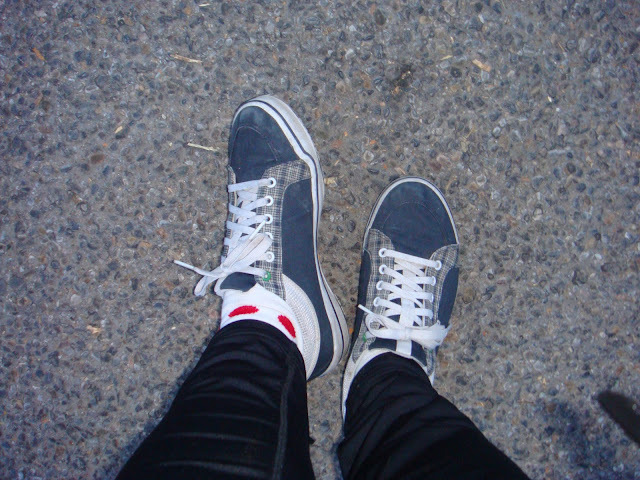 It was freezing the morning of the ride. it had been raining all week long and the cold front was just leaving, it was only 34° when we left Logan at 7:04 am. I hate being cold and so prepared diligently so I wouldn't freeze to death. In the end I was grateful for the insulated leggins, jacket, arm-warmers and booties! This is my amazing support crew! The genius and I created the t-shirts just for this event. They are so awesome, it was a splurge that was fun to do. Being one of the "re-created" photos, the friend is missing from this photo, and it was actually colder on this morning than it was the morning of the race. The t-shirts were a hit, the kids loved them. We did send one to the missionary for p-day attire so he could feel part of the action too. My support crew was the best, completing this ride would have been impossible, and certainly not as much fun without them. even the car gets to dress up for the race! All bundled up, and ready to ride! I'm so glad I purchased the booties, It was soooo cold that morning! Computers reset and ready to go. My brother thinks I'm crazy/weird for using two computers, but if one fails, I still have the second for data. In this case it was a good thing, my cadence sensor for the Garmin quit working just the night before, so the Polar will keep me in check instead. Kind of a bummer, I love my Garmin, it is my motivational speaker. It sings at me when I quit pedaling fast enough, reminding me that I need to keep going. I missed my motivational speaker that day, we have become such good friends throughout the summer. It was only 34° that morning as we left at 7:04 am. On a bike, that is COLD! Some riders didn't prepare very well and were very under-dressed. One woman in our group was so cold, with shivering and chattering teeth she couldn't even talk, while I felt bad for her, I was ever grateful I was warm and toasty. . . prepared to ride. Overall it was a perfect weather for a ride, temps, wind, all of it. Which explains why course records were broken and multiple PB's were obtained. A great year for LOTOJA participants. The boys eating an afternoon snack in Afton. Alpine was next. . . the genius had been calculating with a fair amount of accuracy what time I would arrive at each feed zone, and informed me that I needed to average 16.2 mph to finish before dark. only 47 miles left to go. . . The finish line from the support crew perspective. The genius had predicted that I would arrive at 8:00, and when I came in at 7:45, 15 minutes early, they announced my name and the daughter was hollering, running and jumping down the side line. It was an amazing moment, one that I hope not to forget. Even today, I still tear up just thinking about that incredible moment of victory in my life. It's blurry I know, but this is me . . . I MADE IT TO JACKSON. . . . This was one of the most amazing moments of my life. Be careful to notice that it is not dark yet! I actually made it before dark, even with the stop at the bottom of the hill. 12 hours :39 minutes was my official time. ahhh, real shoes, they feel good! Getting ready to leave Jackson, we are rested, well sort of rested, 206 miles is a long way on a bike, and I am ready for breakfast! I cannot explain how hungry I was. I ate a 1/4 lb. hamburger and criss-cut fries from Billy Burgers the previous night after my shower. The 1/3 hamburger that I couldn't finish the night before we put in the fridge. I ate the remains cold, without complaint, while everyone was getting ready to go. I was more than happy to have it there. By 8:30 am I was starving again. When I say starving, I mean STARVING. I then ate all remaining honeydew, and cantaloupe, the kids had cheese sticks left over from their trek and I finished them off too, then I found another chocolate milk and polished it off. We decided to go to "The Bunnery" for breakfast, by the time we ate at 9:45 I was famished again and ate a HUGE breakfast of Hash Browns, Eggs Benedict, a pancake, hot cocoa w/ whipping cream on top, and a generous helping of breakfast cake. We then went and caught the last of the awards ceremony and by 1:30 I was ready to eat again. I do not ever remember being so hungry. This lasted for almost three days I simply couldn't get enough to eat. The car gets to remain dressed up for the ride home too. . .
Until next year. . . . .